I first met Sandra last year at a concert at Woodbine Racetrack. During our brief conversation, I mentioned that I was going to see ETA Gordon Hendricks perform at the Casablanca Winery in Grimsby. By coincidence, Rock and Soul, was one of Sandra’s many shows in 2016. It was a spectacular evening of dining and entertainment, and was so well attended, it was repeated this year at the same venue. If you read my article, Keeping His Memory Alive, you know that my knowledge of ETAs has snowballed these past few months. I recently learned that many of the artists whose performances I have enjoyed at local casinos are shows that Sandra Gold has booked. I was intrigued by the business acumen of the woman behind the concerts, and wondered what special qualities it takes to run such a successful business. I was pleased when Sandra agreed to an interview for SIDEBURNS Magazine. Q. What circumstances led to you opening your business? A. I was tired of working for others. I don’t drive, so I like to conduct business on the phone. My Jewish family encouraged me to be an entrepreneur and own my own business. A. I am a booking agent, producer, and promoter. I put on my own shows and provide entertainers to casinos in Canada and the USA. Q. How long has your business been in operation? A. Stars on Stage Inc. has been in operation for 14 years. Q. What is your official title in the company? A. My title is President. Q. How many people do you employ on a regular basis? A. My company employs four people. Entertainers are subcontracted on as per needed basis. Q. Are there many women operating your type of business? A. My only competition in Canada is men. There are some women who do run similar businesses, but they operate in the USA. Q. What type of challenges do you face in your line of work? A. It is a big responsibility in making everyone happy, and making sure everything runs smoothly. Sometimes things happen that are beyond my control—the weather and traffic, for example; but I try my best to make sure everything runs smoothly all the time. Sandra Gold with ETA Sylvain Leduc (left) and ETA Gordon Hendricks (right). Photo submitted by Sandra Gold. Q. How has your business changed since its beginning? A. I started with ETAs because I have been a fan of Elvis since I was four years old. I became friends with ETAs at Collingwood. As my company grew, more entertainers started asking me to book shows for them. Fans will ask for different people from different countries, and I deliver. I offer clients the best entertainers available for bookings. Q. Do you meet with any resistance running a business dominated by men? A. My background in business has given me the confidence to book shows on the phone. One man in particular was instrumental in helping me get started with OLG shows because he believed in me. As the Director of Entertainment for Casino Niagara, he gave me a chance and assisted me in procuring my AGCO (Alcohol and Gaming Commission) licence. Q. What are the biggest misconceptions people might conclude when they first meet you? "Tim E is one of my best best friends." Sandra Gold. Photo submitted by Sandra Gold. A. People may make assumptions because I am flamboyant; but what they may not know is that I have an astute business sense. There are different layers to my personality. I want everyone to be happy. I want people to forget their problems when they are at my shows. I am fun and spiritual. I must laugh everyday—and at myself. We must live everyday as if it is our last. Q. Running a business is hard work. How many hours do you work per day? A. My work is ongoing. I can work until 2 a.m. Trust between my entertainers and me is crucial. They know that I mean business, and they respect that. I want them to enjoy the gig I have booked for them because I want them to be happy. I work hard at making sure things run smoothly for everyone. If it goes well, ‘Sandra is a star’; and if not…! Travel is part of my work, and fortunately, I love to travel. Q. What do you do to unwind after a tough day of work? A. I listen to Elvis. I like to do something that is fun, like going for dinner or to a movie. I often get invited to entertainers’ shows. Sandra Gold with husband, Oscar. Photo submitted by Sandra Gold. A. People may be surprised that I have been married for 29 years. 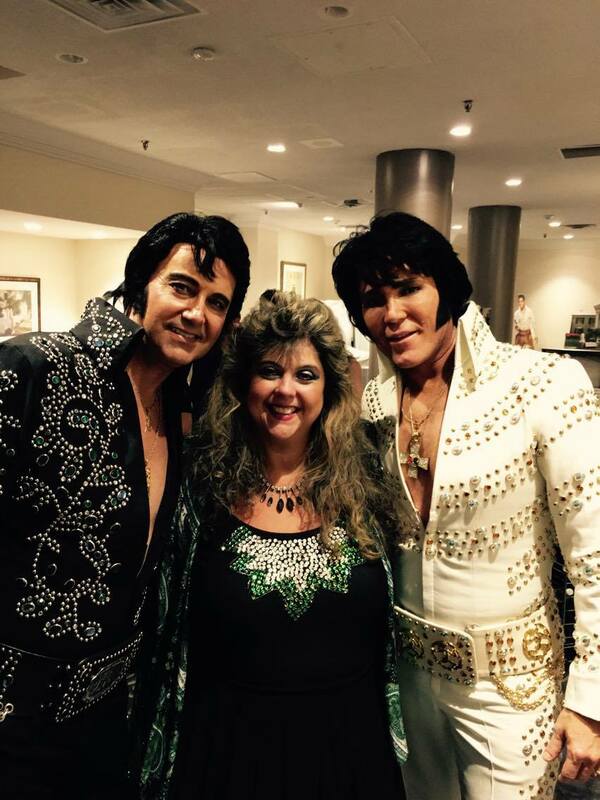 My husband is definitely an Elvis fan—he would have to be or I wouldn’t have married him! Q. How does the process of hiring ETAs and other artists work? A. A customer calls me and asks for a show, or I book a venue. People first, or venue first, it works either way. Q. How difficult is it to find someone to fill in should the occasion arise? Does it happen very often? Are there certain artists you know can rely on in a pinch? A. I have a few I can call on with short notice. Replacing an artist only happens once every few months. Q. Are there certain people you would like to thank for enriching your life? Sandra Gold and long-time friend, Karen Pattiucci. Photo submitted by Sandra Gold. A. I would like to thank my long-time friend, Karen Pattiucci for helping me with contracts, making decisions--in fact, everything! Karen worked long hours with me on the 20 page OLG application. If it wasn’t for Karen I would not have gotten my AGCO licence. I would like to thank my good friend, Rita Caruso, who has been by my side since the beginning of my shows. Rita is my backstage manager and literally does a lot of running around to make sure that shows run smoothly. Thank you to my good friend Sue Harris who helps me with all the extra things that need doing. Sue also provides me with transportation to my shows at US casinos. I am grateful to the three of you for your help, but most of all, I am grateful for your friendship. Sue Harris, Rita Caruso, and Sandra Gold taking care of business. Q. What would you like to add to this interview that has not been covered? A. I am blessed and happy for the people in my life, and they make me want to live. Thank you so much, Sandra, for consenting to be interviewed. I have been to many of your shows these past few months, and I can say with assurance that your goals of making people happy and offering shows that run smoothly have been met each time. During our interview I saw first-hand how you handled an incident involving unexpected heavy traffic, an ETA who was running late due to the traffic, and a client who was concerned because the starting time of the show was very close. At the end of several back and forth phone calls, you managed to make all parties concerned happy. Through it all, you kept your sense of humour, and managed to answer my interview questions—a true professional to the core! Contact information for Stars on Stage click HERE. Sandra Gold with Frank (Sinatra) Campanile (left) and ETA Matt Cage (right). Photo submitted by Sandra Gold. Sandra Gold with Andy Kim. Photo submitted by Sandra Gold. Sandra Gold with Rita Caruso. Photo submitted by Sandra Gold.